*DIAMOND BAR — The father and sister of a 3-year-old girl killed by an out-of-control SUV have been released from a hospital after being injured in the same crash, officials said. Soonil Kwon, 43, and Christine Kwon, 5, were discharged from Los Angeles County-USC Medical Center Friday, hospital officials said. Michelle Kwon, 3, died Thanksgiving Day at UCI Medical Center from injuries sustained in the Wednesday crash at Maple Hill Elementary School, 1350 Maple Hill Road, sheriff’s and coroner’s officials said. *ARCADIA — Authorities have released the name of a man whose body was found floating in the waters of the Peck Road Water Conservation Park Saturday. Phillip Ramos Jr., 48, was pronounced dead at 7:17 a.m. after fisherman discovered the body and called police, Los Angeles County Department of Coroner Investigator Jerry McKibben said. Ramos was listed as a transient with ties to El Monte, McKibben said. *WEST COVINA — A 2-year-old boy was hospitalized Sunday after he fell about 15 feet from a balcony, officials said. The incident occurred about 4:15 p.m. at an apartment complex in the 4100 block of South Sentous Avenue, West Covina Fire Department Capt. Esteban Rodriguez said. The boy was taken to Los Angeles County-USC Medical Center where he was listed in stable condition, the captain said. *WEST COVINA — A local man was arrested Sunday following an 8-hour search after he allegedly threatened a car full of women with a gun and fired into the air, authorities said. Daniel Valle, 27, was arrested shortly after 10 a.m. near Garvey Avenue North and Hollenbeck Avenue with the help of a police dog and a Taser, West Covina police Sgt. Walt Hauser said. *PASADENA — A bagel shop and coffee shop are temporarily closed for business following a fire Sunday, officials said. The blaze was reported just after 9 a.m. at Noah’s Bagels, 605 S. Lake Avenue, which is joined with Peet’s Coffee and Tea, Pasadena Fire Department spokeswoman Lisa Derderian said. *POMONA — Police arrested three people Saturday on suspicion of shooting a local man in the back, authorities said. Anthony Hernandez, 23, of Paramount, Elaina Hernandez, 21, of Wilmington and Luis Duarte, 21 of Long Beach were booked on suspicion of assault with a deadly weapon, Pomona police Sgt. Robert DeVee said in a written statement. *WHITTIER — Three men believed to have ties to various area street gangs were arrested after a brief car chase Saturday, authorities said. Gilbert Gonzalez, 25, of Whittier, Daniel Gonzalez, 28, of La Puente and Edgar Archila, 20, of Bellflower were booked on suspicion of felony possession of a firearm and misdemeanor evading, Whittier police Sgt. Jim Uhl said. *PASADENA — A 23-year-old man was arrested Friday for allegedly stealing a car after a short pursuit that began near the Art Center College of Design, police said. The ordeal began just before 3 p.m. when a man at the college noticed his car being driven away as he walked to the parking lot, Pasadena police officials said. *PASADENA — A 28-year-old man was robbed at an ATM machine in the 100 block of West California Boulevard early Saturday morning, officials said. *SOUTH PASADENA — A man was arrested on suspicion of drunken driving late Saturday after his car struck a parked car, a telephone pole and an oak tree, authorities said. Edouard Nersisian, 26, of Pasadena was jailed in connection with the crash, which occured shortly after 10 p.m. in the 700 block of Garfield Avenue, South Pasadena police Officer Matthew Ronnie said. CLAREMONT — A man jumped to his death early Sunday from a 210 Freeway overpass, and a 68-year-old woman was killed when her car plowed under a truck that had slowed because of the suicide, the California Highway Patrol reported. As a result, a two-mile stretch of the 210 freeway at the eastern end of Los Angeles County was closed for more than two hours, from Fruit Street east nearly to the San Bernardino County line. At about 5:50 a.m., a man described only as in his 40s climbed over the perimeter fence of the overpass above the 210 Freeway at Towne Avenue and jumped into the fast lane of the freeway below, according to CHP Officer P. Busch. The driver of a Toyota van heading east was unable to avoid hitting the man, who died at the scene, Busch said. About an hour later, a 68-year old woman driving east in a 2000 Chevy Impala crashed into a passenger car, and then a truck that had slowed to 10 miles an hour in the ensuing backup. Her car wedged under the truck, and the woman, who was not wearing a seatbelt, died at the scene, officers said. Her name was not released, and no one else was injured, CHP officers said. VALINDA — Jury trial is set to begin Wednesday for two men accused of fatally shooting a man who confronted them while they were tagging. Robert Alex Lopez, 19, and Anthony Alex Castillo, 21, are charged with the shooting death of 44-year-old Robert Whitehead of Valinda on March 9, 2006. The two suspects pleaded not guilty in the killing in July at Pomona Superior Court, where the trial will be held. Castillo and Lopez allegedly shot Whitehead after he confronted them for tagging on a neighbor’s wall, officials said. A third suspect in the killing has since been killed himself in a shooting. According to court records, Castillo and Lopez are each being held in lieu of more than $1 million bail. A pair of brazen robbers opened fire inside a medical marijuana dispesary in Mission Hills Friday before helping themselved to cash and pot, the Associated Press reports. MISSION HILLS– Police say two men robbed a medical marijuana facility in Mission Hills and made off with cash and drugs. Los Angeles police Lt. Darryl Grayson says the two men entered the facility on Friday and opened fire. No one was injured but the robbers took $200 to $300 in cash and an unknown amount of medical marijuana. Grayson says police surrounded the building but the gunmen has already escaped and police dogs were unable to find them. LOS ANGELES – Five people, one of whom was pregnant, were killed in traffic accidents in Los Angeles County during the first 60 hours of the Thanksgiving holiday weekend, according to a report by the California Highway Patrol. Last year’s holiday toll was four. Statewide, 21 people died in traffic accidents both this year and last. CHP Officer Patrick Kimball said that while drivers seemed to slow down during the period of high gas prices during the summer and early fall, they seemed to be speeding up again, fueled by cheaper gasoline. The CHP also made 199 arrests for drunk driving in Los Angeles County during the holiday period, compared with 232 arrests during the same time in 2007, reflecting a decrease of about 14 percent. The California Highway Patrol’s data for drunk driving arrests covers their jurisdiction of state roadways and unincorporated areas within the county, but not most city surface streets. ARCADIA — For the second time in just under a year, a body has been found floating in the waters of the Peck Road Water Conservation Park. The grisly discovery was made about 7 a.m. Saturday at the park, located at 5401 N. Peck Road. The body was that of a man. No further details were immediately available. On Dec. 6 of last year, the body of Lanie Cole, 38, of El Monte was found floating in the very same waters. After a lengthy coroner’s examination, officials determined Cole drowned while intoxicated. 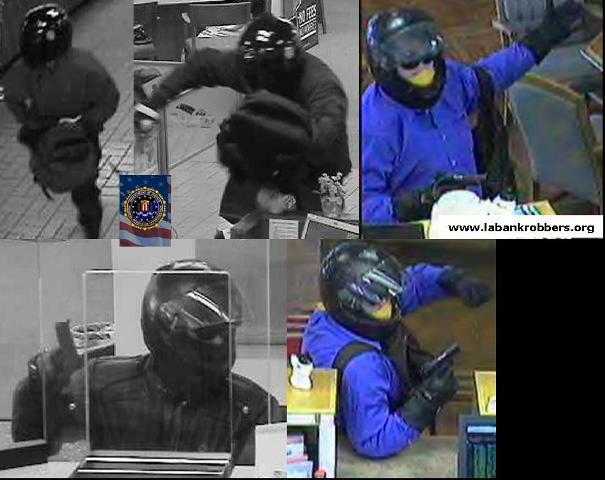 The FBI announced earlier this month they are seeking a serial bank bandit or team of bandits believed to have carried out a violent take-over robberies in Long Beach and a failed heist in Pasadena. The so-called Sport Bike Bandit, or possibly bandits, earned his moniker by wearing a motorcycle helmet during the crimes and using a sport bike to flee. By all accounts, this robber or team of robbers is a particularly nasty one. 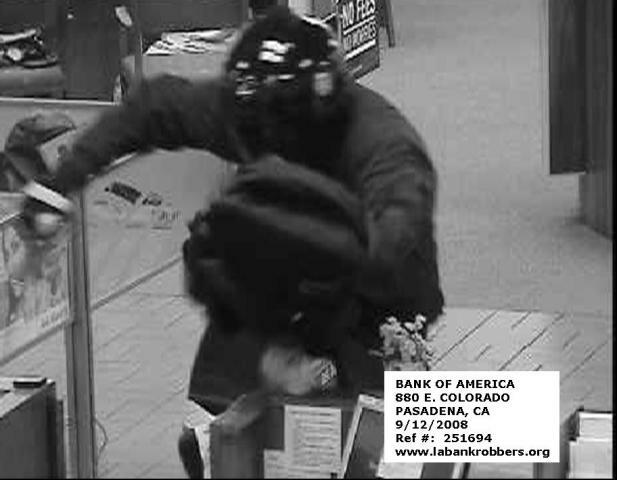 In Pasadena, a helmet-clad man entered the Bank of America, 880 E. Colorado Blvd., on Sept. 12, police and FBI officials said. He used profanity and ordered witnesses to the floor at gunpoint, officials said. A female employee failed to obey the robbers commands, and the robber leaped over the counter toward her before a co-worker grabbed her and pulled her to the floor, Pasadena police officials said. Possibly because of the distraction, the robber fled empty-handed, police and FBI officials said. Successful robberies were reported at Long Beach banks on July 25 and Oct. 28, according to the FBI. 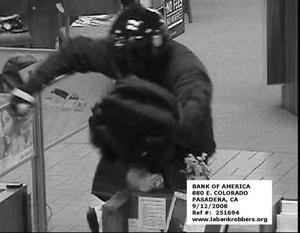 In the first heist, a robber wearing a motorcycle helmet and possibly wielding two handguns threatened people inside the bank before fleeing with the cash on a motorcycle with the letter “J” in the license plate, FBI officials said. In the more recent Long Beach robbery, the robber was described as nervous and did not take over the bank, but rather targeted a single teller, FBI officials said. In all cases, the robber was described as a man of medium build wearing a black motorcycle helmet and either black or blue jackets. Anyone with information is asked to call the FBI’s 24-hour tip line at (888) 226-8443. Not only are the holidays a busy time for shopping and travel, but it’s also a busy season for burglars and thieves, authorities warn. Law enforcement agencies found themselves just as busy Thursday and Friday, as they made a series of burglary arrests around the San Gabriel Valley. It’s Christmas for criminals, too, officials explained, and thieves seem to prefer to do their shopping from out of someone else’s car. Car break-ins are especially common this time of year, Los Angeles County sheriff’s Sgt. Kevin Walk said. Significant burglary arrests were made Thursday and Friday in Industry, Covina and Alhambra, officials said. To car burglars, the rush of holiday shopping presents an opportunity, Walk said. “(Thieves) watch cars in the parking lot. People drop their presents in the car and shop,” he said. Walk said a good way to avoid being a victim this holiday season is to be aware of your surroundings. He also said not to leave items in your vehicle as you shop. “If you’re at a mall or something like that, maybe have the store hold your items until you’re ready to leave,” the sergeant said. He also advises dropping items off at home in between shopping trips, and said to never leave valuables in the car in plain sight. Purse snatchings are also common around the holidays, Walk said. Happy Thanksgiving. Eat a lot, watch football and have a good time with your families…. ARCADIA – Police arrested four people – including a 13-year-old – on prostitution-related charges last week by responding to Craigslist advertisements, officials said. Arcadia police do not actively monitor Craigslist for advertisements of sexual services. But one officer decided to take initiative in two cases last week, said Sgt. Dean Caputo. The officer called the phone numbers that were advertised and arranged meetings at the Santa Anita Inn. Police met a female adult there, and after she had allegedly entered a room and offered sexual services for money, officers arrested her on suspicion of solicitation of prostitution. After repeating that process with a second Craigslist advertisement, officers arrested a 13-year- old girl at the same inn. They also arrested two women in their early 20s, who allegedly had brought the teen to the hotel, on suspicion of pimping and child endangerment. The two arrests were made at 12:30 a.m. and 9:30 p.m. on Nov. 21, respectively.